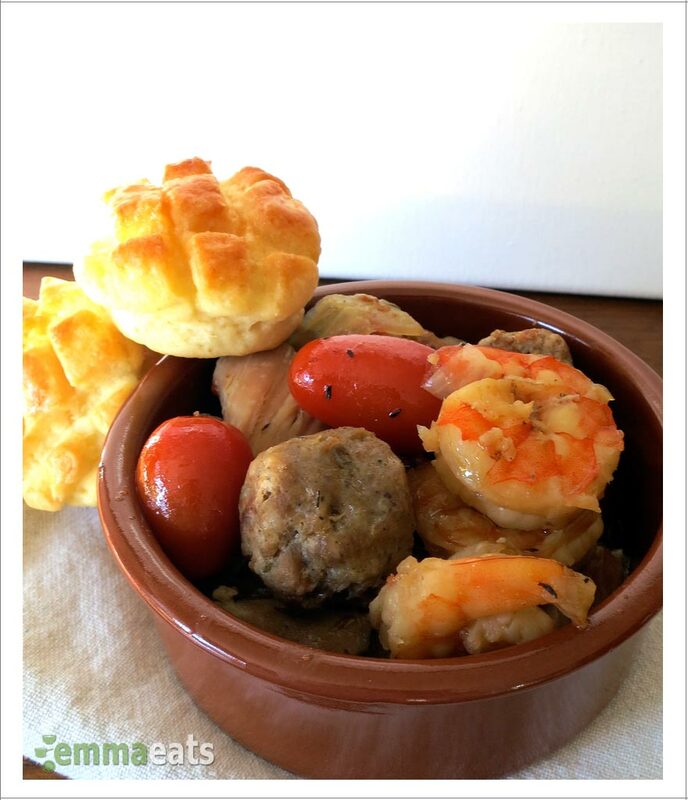 Chicken Sausage and Shrimp Gumbo | EmmaEats…and Katie too! Gumbo. Creole. Etouffee. Jambalaya. Mmmmmm. Emma has a bit of a love affair with New Orleans. After reading some Princess and the Frog books (she hasn’t watched the movie yet — how will she react to the Shadow Man and his compatriots?!) and hearing about Princess Tiana enjoying her father’s gumbo, she became intrigued with it. Here we go again: she shows the interest and I’m all too happy to introduce her to something new. This isn’t gumbo the truest of forms — because Emma currently doesn’t love cooked tomatoes or peppers, I’ve used whole tomatoes and large pieces of pepper so the flavour permeates the broth, but isn’t in chunks in every bite (G and I get to enjoy those big pieces in our bowls). And, rather than preparing a roux, the flour is browned in oil when the chicken is browned, but it has a wonderful combination of ingredients and seasonings that in the end makes for an easy one-pot flavourful meal that will warm your belly. Heat 1 tbsp of olive oil. Fry the sausage pieces until browned on all sides. Remove to a bowl and set aside. Add chicken to pot and sprinkle with the flour, salt, white pepper and paprika. If starting to stick, add up to 1/4 cup of the chicken broth. Once the chicken is browned, remove it to the bowl with the sausage. Add the remaining oil. Fry the onions and garlic until softened and slightly golden. Add the sausage, chicken, red pepper, tomatoes, thyme and enough broth to just barely cover the contents. Bring to boil and then reduce the heat to medium. Simmer for 45 minutes, partially covered. Add the shrimp and push them into the stew. Stir in the peas. Continue cooking until the shrimp is pink and cooked through. Season with additional salt and pepper to taste. Serve hot over rice (which is how gumbo is usually served) or with crusty bread on the side.